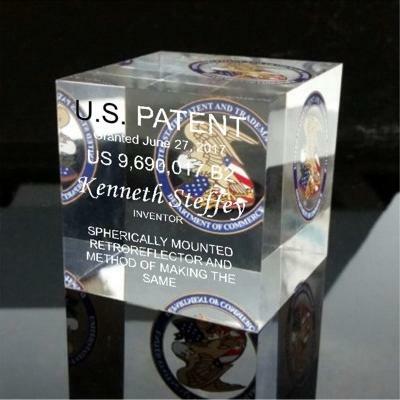 Solid Clear Acrylic features the United States Patent Office Seal in Full Color printed from the back. Standard layout is Patent Number, Date, Inventor Name, and Title. Incorporate your Print Ready Art or Logo. Engraving can be optional. Call our Customer Service line for details. Overall dimensions, 2 x 2 x 2”.